Take the hassle and time out of designing and making your own chemical labels. Get pre-designed and chemical identification labels for the most common hazardous chemicals found in the workplace. • Drill down by chemical. Within each chemical below, you will find a range of RTK label designs. • Choose from materials including white laminated vinyl and 100% recycled paper. Vinyl labels withstand high temperature and chemical abuse. Both materials are backed by strong adhesive that sticks labels to any clean, flat or curved surface. • We also offer DOT placards for shipping chemicals. Placards are constructed of water-resistant tagboard and printed with light fast inks. Find some of the most popular preprinted label designs here. We offer dozens more. Use our Search feature to locate a particular chemical within our library of premade / preprinted chemical labels. • More than 130 pre-printed NFPA labels ready to ship. • NFPA Chemical Labels come in 2 different sizes with paper and vinyl options. 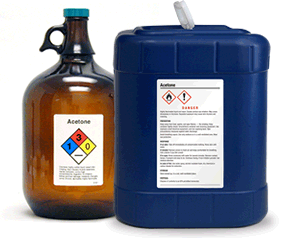 • Over 130 pre-printed ANSI Chemical Labels in stock. • Find durable label designs for Acetone, Isopropyl Alcohol, Gasoline, Kerosene, Methanol and more. • Find 20 common chemcicals. Labels are designed by a HazCom labeling PhD specialist and comply with GHS standards. • Labels save time, provide enhanced legibility and help prevent needless chemical exposure and illnesss.